How do you use Solbio? Solbio works hard in the waste tank, turning the contents into liquid and preventing unpleasant smells and gas formation. Dosage: 40 ml per 0-20 litre tank capacity + 2 litres of water in the waste tank. Solbio prevents the formation of black particles and keeps your tank and toilet fresh and clean. Dose 40 ml of Solbio per 20 litres of tank capacity. You can also use Solbio in the wastewater tank to prevent unpleasant smells and keep the tank free of grease deposits. Pour 40 ml of Solbio per 50 litres of tank capacity into the sink or shower drain. 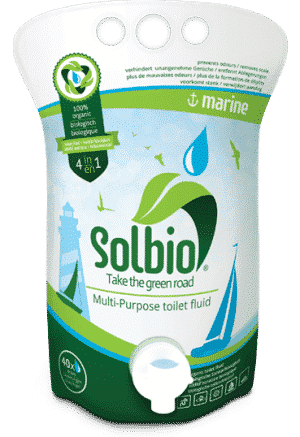 Our Solbio organic toilet fluid removes lime and urine stains without affecting the toilet. A little Solbio on the toilet brush or in the tank will keep the toilet clean and fresh. Many campers prefer not to fill their caravan or motor home with chemicals. So sitting on top of a pile of chemicals on your camping trip isn’t healthy or pleasant. Mixtures you make yourself with acids and chlorine can damage the rubber and seals on mobile toilets. That’s why Solbio is the alternative that combines natural ingredients and cleaning power. “Can an organic toilet fluid clean as well as a chemical one?” we can almost hear you thinking. But did you know that nature offers excellent solutions? Mother Earth provides us with the most powerful cleaners! We use only 4 ingredients in Solbio organic toilet fluids. All of them can be found in nature. Natural soaps, natural citric acid, 100% natural essential oils and plant extracts do the dirty work for you. Clean air, green surroundings, sun, beach, forest; nature is an integral part of camping. Chemicals are the opposite. Our goal: to develop a completely organic toilet fluid that’s just as good as the chemical option. 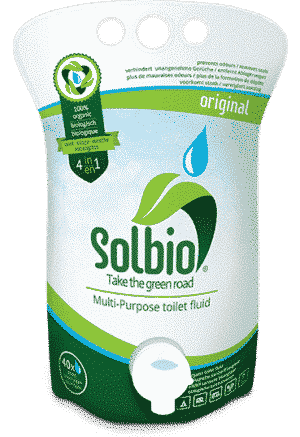 Not only is Solbio greener and cleaner, but because we only use natural ingredients, the toilet fluid is 100% safe, for nature, your health and your toilet. The unique 4-in-1 formula only makes things easier for you. Any chemical toilet can become an eco toilet!